What impact does humidity have on rooms? At least two-thirds of our lifetime is spent indoors. Whether we feel well and comfortable at home, at work or any other place indoors depends to a great extent on the quality of the indoor climate and in particular on the temperature and humidity inside rooms. Both factors affect not only the health and wellbeing of the occupants, but also the preservation and the structure of the building together with its furniture and furnishings. Which humidity level is comfortable? How do I achieve the ideal humidity in living spaces? What causes humidity to increase? How can you lower the humidity? Keep an eye on your thermo-hygrometer for the ideal indoor climate. Your instrument will allow you to immediately recognise when the ideal values are exceeded or fallen short of. Before the onset of mould growth or your health being affected by an ambient air that is overly dry or too wet – you can act quickly to create the ideal combination of humidity and room temperature through targeted ventilation and heating. A relative humidity of 40% – 60% and a room temperature of 18 – 22 ° C are perceived as pleasant by most people. The feeling of warmth varies amongst individuals and it depends on the clothing the person is wearing, the activity undertaken, as well as on the temperature of surfaces. The colder the wall surface is, the higher the air temperature must be to create a comfortable living environment. Hence, well-insulated exterior walls not only prevent heat loss, but also increase the temperatures on the wall surface and thus the quality of living. Depending on the relative humidity level, despite modern insulation, it may be necessary to intervene in order to control the indoor climate. Optimal indoor climate by monitoring temperature and humidity in rooms. 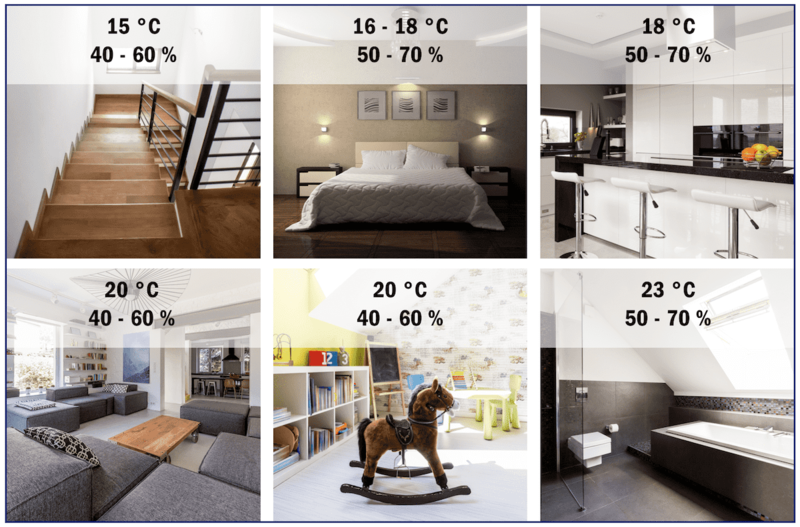 Graphic showing the optimal values ​​depending on the room. One of the main ways to control the indoor climate is through targeted ventilation and heating. Never switch off the central heating completely when you are away. Keeping at a lower average temperature is more economical and avoids burst pipes due to freezing weather condition. Keep interior doors closed between differently heated rooms during the day and at night. Open the windows completely for a short time (ventilation). Tilting windows is ineffective, wastes heating energy, and it can even promote mould growth. Ventilate across entire house (cross ventilation). Ventilate in all kinds of weather, even when it rains. Exterior cold air is drier than the warm indoor air. The cooler the room temperature is, the more often you need to ventilate. The colder it is outside, the shorter a building must be ventilated. Ventilate more frequently if the building has double/triple glazing windows. Ventilate bathrooms and kitchens immediately after showering and cooking and directly to the outside (i.e. windows), rather than opening internal doors. Showering, cooking and drying clothes: people continuously release water vapour in the air with these activities – about 6 to 12 litres of water per day in a 3-person household. In this way, the water vapour content in the room air increases. Bearing this in mind, it is important to choose the right combination to regulate the temperature and humidity levels in the air. With the help of a hygrometer or a thermo-hygrometer, you can keep an eye on these values. If you are experiencing problems related to overly dry indoor air, some small tricks may remedy the situation. Indoor plants and indoor water features and fountains are ways to increase the humidity in rooms. Anyone who has larger aquariums at the home must, in any case, regularly check the moisture content in the room air in order to avoid over-humidification. Another way of increasing the moisture in the air, particularly when it’s overly dry, is to utilise a well-known home remedy for the central heating season: place a bowl of water near the radiator or simply hang up wet towels or the washing indoors, just helps in the winter months. Alternatively you can opt for a quicker solution such as a humidifier. Be careful when using water features and fountains to add moisture in the air. If there is not enough air exchange, the indoor air can quickly become very damp and if the humidity is too high, there is a risk of mould and saline efflorescence on walls. Furniture, books and other delicate items can get damaged as well. Place several bowls with salt around the house. Measure the indoor humidity and temperature regularly. At TFA Dostmann, you will find analogue and digital hygrometers that help you to create an ideal indoor climate. In order to maintain an ideal room climate, we also recommend that you consider measuring the CO2 levels indoors.